A dishy, skeptical portrait of Jared Kushner, the naive, overleveraged, and conflict-mired developer’s son who has Donald Trump’s ear. Intermittently, anyway. A running theme of investigative reporter Ward’s (The Liar's Ball: The Extraordinary Saga of How One Building Broke the World's Toughest Tycoons, 2014, etc.) book is that the husband of Trump’s daughter Ivanka is so clumsily meddling that the president keeps him at arm’s length. “Get rid of my kids, get them back to New York,” Trump reportedly said of “Javanka” six months into his administration, after their presence became like sticky tar in the West Wing. How did Kushner, with no political or foreign policy experience, become the White House’s point person on corporate innovation and peace in the Middle East? Thereon hangs a tail of greed, incompetence, desperation, and felonious behavior. Jared’s father, Charlie, was a mercurial New Jersey developer who wasn’t above tax fraud and blackmail to get ahead. (He was sentenced to two years in federal prison in 2005.) 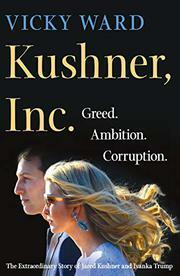 Jared was key to restoring the family’s good name, which entailed a role in the family real estate business, though he “was hardly ever in the office”; a job as publisher of the New York Observer, though journalism baffled him; and his marrying Ivanka, another scion of a developer with a dodgy history. When Jared doesn’t seem out of his depth, he seems corrupt; much of Ward’s story turns on his disreputable dealings with Saudi and Qatari leaders, perhaps pursued in hopes of covering the $1.2 billion mortgage on a Manhattan Kushner property. Many details here have been previously reported, and the author’s efforts to elevate the book above a clip job rest mainly on a raft of juicy quotes delivered by anonymous sources. (“Jared is as sinister as Donald Trump,” intones a “business associate.”) As a portrait of Jared’s character, the book’s fiendish aura is hard to trust, but given the factual record, it’s not out of bounds. A handy primer on a troublesome Trump in-law, even setting its gossipy parts aside.